As we discussed yesterday, Dublin, Ireland is five hours ahead of Eastern Standard Time. So when polls opened at 7, it was 2 in the morning here in Washington, DC. 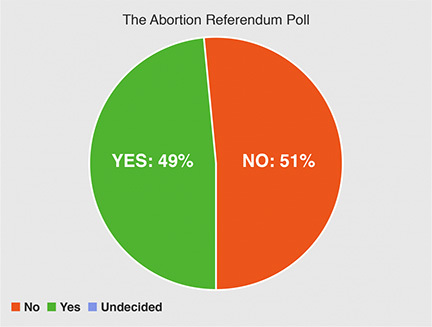 A Yes vote on the abortion referendum would rid the Constitution of the 8th Amendment and authorize Parliament to legislate on abortion—or No—to retain the provision which guarantees equal rights to unborn babies and their mothers. What do we know so far, according to media reports? Since the beginning of the campaign, we have commissioned tracking polls to monitor the views of voters on the referendum. We have also commissioned an independent analysis of all recent opinion polls, including the latest of our own tracking polls, which projects the outcome of the referendum based on the likely turnout and the support for Yes and No within each age group. That analysis predicts the following result for today’s referendum. The No vote, 51%, the Yes vote, 49%.